Cause Papers Database: a searchable catalogue of more than 14,000 cause papers relating to cases heard between 1300 and 1858 in the Church Courts of the diocese of York. The original records – the most extensive records of their type in the United Kingdom – are held in the Borthwick Institute for Archives at the University of York. The catalogue contains basic information (people, places, type, keywords) about each case, allowing searches for e.g. 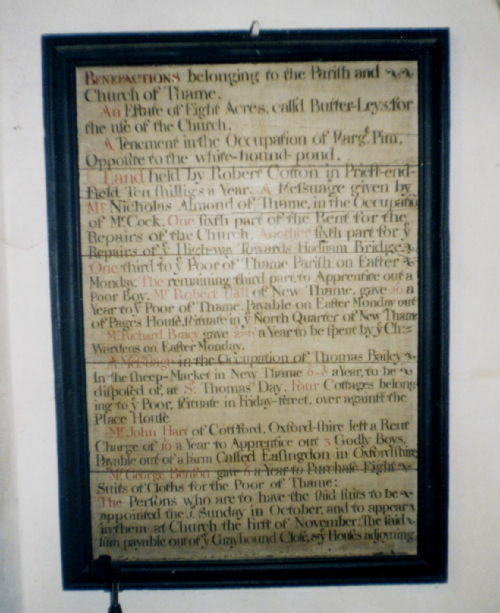 “parish”, “churchwarden” in specific places and periods etc. Churchwardens’ Accounts: a guide leaflet compiled by the Borthwick Institute for Archives, York. 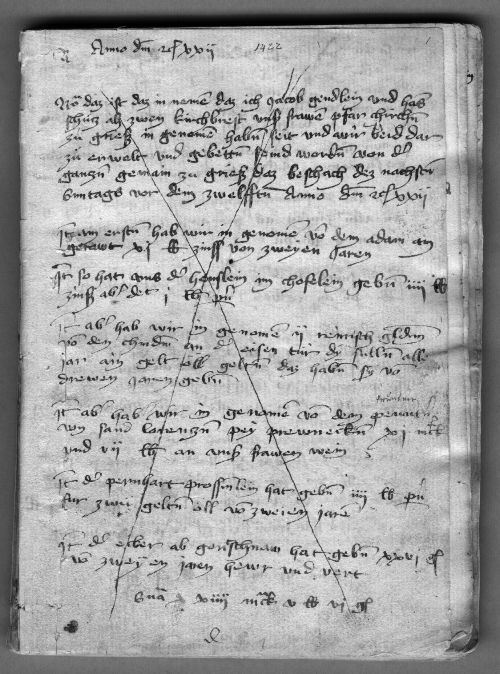 Transcript of the two passagesExcerpts kindly submitted and transcribed by Hannes Obermair of the Stadtarchiv Bozen / Archivio Storico Cittá di Bolzano. The original documents – previously in the possession of the Drechsel-Mayr family – are now held in theSüdtiroler Landesarchiv / Archivio Provinciale di Bolzano. Manuscripts of the Bibliothek des Geistlichen Ministeriums, an early modern parish library, in the Dom of St Nikolai at Greifswald / Germany. Photo: BK. 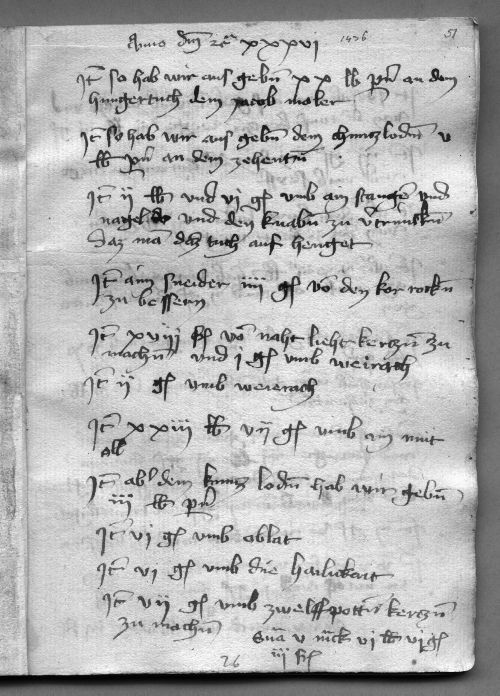 Churchwardens Accounts of St Michael Spurriergate, York, extract for the year 1546, transcribed and introducedby Christopher Webb, Borthwick Institute for Archives, York. For the printed edition of this set of accounts for the period 1518-48 see the ‘Parish Bibliography’. Consistory Database: featuring testimony offered in the main church court of the diocese of London, an ecclesiastical jurisdiction that included the medieval city of London itself and its rural hinterland of Essex, Middlesex, and parts of Hertfordshire; projected over the next several years to present all the surviving medieval (pre-1500) records of litigation in this court (about 1100 depositions and examinations altogether), both in transcription of the original Latin of the documents and in modern English translation..
Court Depositions of South-West England 1500-1700: a digital edition of 80 fully transcribed depositions relating to 20 cases heard in the church courts and Quarter Sessions between 1556 and 1694 across Devon, Hampshire, Somerset and Wiltshire. These depositions or witness statements, collated by the 'Women's Work in Rural England' project, relate to a range of crimes and offences tried in these two types of courts, from defamation to theft and are rich in detail of social, economic, political and religious life in early modern England. Deutsche Inschriften Online: web database of Latin and German inscriptions in German German-speaking Europe up to 1650 (with illustrations, transcriptions and commentary). To retrieve hundreds of inscriptions from churches enter “kirche” under “Suchworte” on the search page. The findings of this large-scale research project are also available in a series of volumes dedicated to specific regions and towns. Enforcement of the Statutes of 1529: following legislation to reform the English parish clery (esp. to restrict absenteeism and economic activities like holding leases), anyone who chose to inform on/prosecute offending clerics could gain the penalties imposed on them by the royal courts. Collection of photographs of relevant cases compiled by Robert C. Palmer at the University of Houston (for context and explanation see his Selling the Church). English Monastic Archives: databases of religious houses, properties and archives compiled by a research team led by Maureen Jurkowski and Nigel Ramsay at UCL. This guide to one of the largest sets of medieval documents includes extensive evidence on parishes appropriated by religious houses. Epidat: a database of Jewish epigraphy - provides the inventory, documentation, editions and presentation of epigraphical collections. Currently online are available 188 digital editions with 34536 epitaphs (65970 image files). Inventories of parish archives in the Diocese of Como (Italy): with information on holdings, parish history and relevant secondary sources. Leichenpredigten (Germany): the “Gesamtkatalog deutscher Leichenpredigten GESA” provides a searchable catalogue of nearly 200,000 German funeral sermons compiled at the University of Marburg. 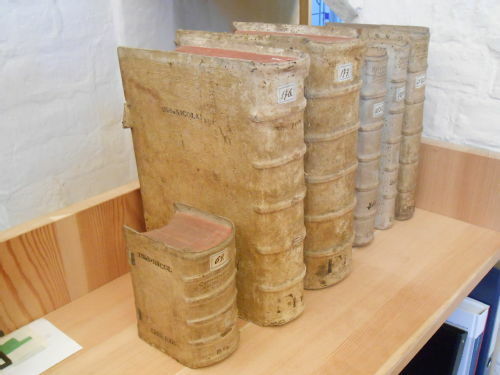 Leichenpredigten (Wolfenbüttel): catalogue of nearly 10,000 funeral sermons preserved at the Herzog August Bibliothek at Wolfenbüttel. Post-Reformation Digital Library: vast collection of primary resources/e-books relating to the development of theology (ca. 16th-18th c.), compiled by the Henry C. Meeter Center for Calvin Studies, Calvin College and Calvin Theological Seminary. Features e-versions of works by theologians of all major denominations and additional resources (Bibles, correspondence, secondary materials). 'Stillstandsprotokolle' (1631-): searchable edition of 17thC proceedings of the principal parish authorities (known as Stillstand) in the Canton of Zurich, consisting of pastors, wardens/elders plus secular village officials and dealing with a broad range of matters relating to church, schools, morals and poor relief. Wien, St. Peter: digitization of the entire archives of St Peter in Vienna, comprising manuscripts and (printed) books from the 18th century, in particular relating to the rebuilding of the church. English post-Reformation parish music: examples of psalm-singing and organ accompaniments recreated by the Dufay Collective for Christopher Marsh’s Music and Society in Early Modern England (Cambridge, 2010), audio CD, tracks nos 43-46, and of bell-ringing performed by the ringers of St Bartholomew the Great, Smithfield, nos 47-48. ‘Church Gallery’: images of English parish churches and cathedrals compiled by BBC History. ‘Church Heritage Record’: publicly accessible database due to be launched in spring 2015. Compiled by ChurchCare with the assistance of English Heritage, it will feature over 16,000 entries on church buildings in England (integrated with a Geographic Information System GIS), covering a wide variety of topics from architectural history and archaeology, to worship and the surrounding natural environment. Cornish Parish Churches: offers photographs of all parish churches (as well as many fonts and stained glass windows) in Cornwall. An interactive DVD is also available. The Digital Atlas of England: co-ordinated by C. B. Newham, this project aims to obtain photographs of all rural churches (and some associated buildings) in England. By late 2011, the archive included 330,000 pictures, representing 70 per cent of the envisaged total. This presentation provides an impression of the range of buildings, furnishings and motives. ‘Ex voto’ pictures database from Sammarei nr Passau (Lower Bavaria, Germany), supplied by the historical demographer A.E. Imhof (Berlin). Heritage Technology: website of Heritage technology specialists developing virtual reconstructions for the interactive “Parish Church” DVD published by the Christianity and Culture initiative. Sample materials include York's Micklegate Priory Revealed and Stratford-upon-Avon guild chapel. Imaging the Bible in Wales Database: online collection of nineteenth- and twentieth-century Biblical artwork (from churches as well as other sources) compiled at the University of Wales Trinity Saint David. ‘Parish Church and the Landscape Wiki’: online collection of church images from the dioceses of Cambrai, Le Mans and Schleswig produced in the course of a research project based at Oxford Brookes (searchable by parish and subject). ‘Pilgrims and Pilgrimage’: illustrations and commentary, e.g. on the late Middle Ages and Reformation period, provided by the 'Christianity and Culture' project at the University of York. CD-version of the project includes a 3D-reconstruction of the parish church of St Mary, Thirsk, on the eve of the Reformation. Post-Reformation Wall Painting Project: launched in 2014 by C.B Newham and Dr Ellie Pridgeon to tackle the lack of comprehensive catalogues or academic literature on the painting corpus, which is extremely extensive. Focusing on murals in English churches between 1559 and 1836, the project aims to document, research and publish on these visual sources. Rare Reformation Relics: virtual exhibition (under the auspices of ArtRefo) presenting images and objects from the collections of museums across Europe that testify to the richness and variety of post-Reformation visual and material culture. Here portraits and visual satires from both Lutheran and Reformed contexts are juxtaposed with objects as diverse as enamel plates, liturgical textiles and communion vessels. Stained Glass in Wales: searchable online catalogue/database of work from the fourteenth century to the present day, compiled under the auspices of the University of Wales Centre for Advanced Welsh and Celtic Studies by Martin Crampin. Stratford-upon-Avon, Guild Chapel: information and teaching resources relating to the reconstruction of late medieval wall paintings (Doom, Dance of Death, Holy Cross legend) in a collaborative project of historians, archaeologists and Heritage Technology Limited. Swedish Medieval Art (Medeltidens bildvärld): provides access to some 19,000 pictures of artworks (sculptures, paintings, fonts etc) from Swedish churches, searchable by region/place, material, topic and museum (in Swedish). Teregua (Valtellina, Italy): 16th century wall paintings (by Vincenzo de Barberis) and wood sculptures of the Chiesa della Santissima Trinità [Holy Trinity Chapel] in the parish of S. Nicolò, Valfurva. 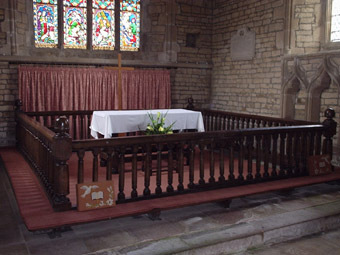 Somewhat against the spirit of the Laudian reforms (aiming to re-enhance the ‘beauty of holiness’ through moving altars to the east wall of chancels and demarcating them by means of a rail), the parishioners of St Andrew, Lyddington (Rutland), railed their communion table on all four sides (left). 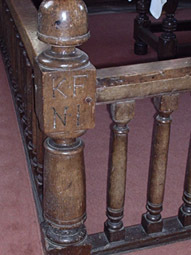 The work was carried out in 1635 under the supervision of the vicar, Richard Rudd, and the churchwardens, Kenolm Fowler and Nicholas Jordan (initials on the right). Photos: BK.